Must sell -- Built w/hand-pealed 15-18" diameter Douglas Fir logs from BC. 31 Leis Crescent in Alice Beach. Front wall of windows overlooking green space, close to main beach, parks & activity centre. Cabin at lock-up stage, with 1000 gal. septic, 1000 gal. cistern, sump pump & 200 amp. electrical service and natural gas service. 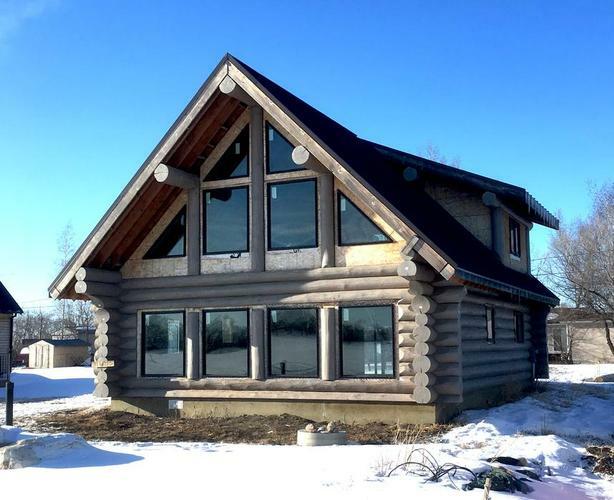 Cabin includes 1,352 sqft with layout plan for open-concept kitchen/dining/living room; 1full bath, 1 master bedroom, utility/storage space, and loft space for 1 or 2 bedrooms, featuring 2 large dormers for sunrise & sunset vistas. Large, double-pane/metal e-windows and patio doors at back, with lots of space for garage, deck & more on this large 65' x 143' lot. All materials & construction for long-term durability and low/no maintenance. Logs sandblasted & finished with high-quality long-lasting stain and EMSeal between for hot-cool thermal efficiency. Zero-maintenance metal roof with closed seam fasteners, 25-year warranty. Foundation exceeds engineer's specs. Available immediately, original plans included. Main: 25'x35', Loft: 14'x25' Basement is crawl space. Built in 2014.